I got a wake up call when I realized all the loans I took out for school actually went for school. 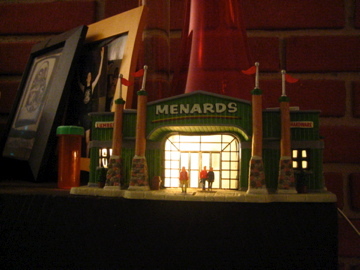 I'm only working part-time at Menards now which is just enough to pay the rent and bills. My phase of being poor wasn't really a phase, but actually permanent. I took out another loan so I would have extra cash to feed me (being poor is the best diet). I won't see that money for another month which means no time off for a Christmas break. I have to wait a few more days to find out if I even get Christmas Eve off. This is by far the sadest Christmas ever for me. It doesn't even feel like Christmas. Only one house on my street put lights up, I'm used to everyone in my whole town putting up lights. Plus we don't have a tree or any decorations and we haven't had any snow yet. I did get a Christmas present from Menards, 55 dollars in Menards money and this. In two weeks someone I love and care about very deeply will be in London for 5 months and I only get to see him for 2 more days. It's going to be a rough half year, but I'm hopeful. This is a good time for any visitors. Next semester I get to start taking baking classes, I can't wait. Maybe I'll gain back all the weight I lost. For the first time in my entire life I'm finally getting A's and I actually enjoy going to school. I wish I had a friend here that liked to do crafts as much as I do. I'm going to start devoting one evening a week to doing crafts and catching up on a lot of unfinished projects. I know, I'm a grandma sometimes. I got your Christmas card yesterday! Hopefully I'll get to visit sometime in the next month or so. Jenny is having the baby tomorrow!!! I miss crafting with you too, I'm making a blanket for the baby, I don't know if I'll finish it in time. I WILL COME AND DO CRAFTS WITH YOU!!!!!!!!!!!!!!!!!!!!!!!! thats a good plan. I should do that. We'll see, i get lazy for awhile after school is done. I'm tired of doing stuff. one of your aunts works with my friend sue.. this town is WAY too small! I'm waiting for your next blog!!! Come on! Love you!!! have a stupendous day! !